One and a half years, that's exactly how long it has been since General Motors turned a new leaf in India by launching the Chevrolet Beat. The car has proved to be a brilliant package combining a great mix of style, interiors, efficiency and dynamics. It even went on to win OVERDRIVE's small car comparo in March last year. The car took off with great enthusiasm but with more manufacturers wanting a slice of the small car pie, the Beat eventually was overshadowed by its newer rivals which are available in diesel form as well. After announcing their plans to manufacture an India-specific diesel engine, GMI inaugurated the Talegaon engine facility near Pune last year and have finally launched the Beat in its diesel avatar, the company's first diesel hatchback. We decided to pit it against the best diesel hatchback in its price band, the Ford Figo diesel. 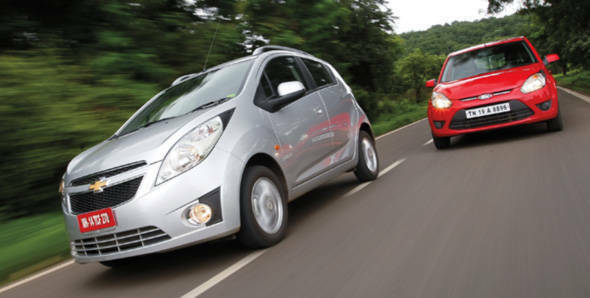 Can the Chevrolet Beat diesel actually beat the Ford Figo diesel? The Beat has always been stunning to look at and even after being around for a while it doesn't look like it is aging. It's still fresh and stands out among other hatchbacks. The huge front head lamps and the signature Chevy grille immediately catch one's attention while the upswept crease, prominent wheel arches and the recessed rear door handles give it a sporty character. From the rear, the car looks smaller than most hatchbacks but the tail lights add to the sporty feel. The Beat really has no bad angle and looks good when viewed from any. Inside the car, the sporty superbike inspired instrument cluster looks snazzy. The digital display shows the tacho while the speedometer is analogue. The design of the dashboard is attractive while offering good fit and finish, material quality and decent storage space. The car we tested was the fully-loaded version, so just like in the petrol variant, the diesel Beat also gets auto climate control, integrated stereo and that glossy piano black panel. The blue lighting for the stereo console, instrument cluster and climate control knobs give it a funky look in the night. The Figo design on the other hand is simple, not as young and vibrant as the Beat. The car is a combination of the older Ford edge design (giving it a slightly boxy look) and hints of Ford's current Kinetic design language. The front end is pretty modern with its slick head lamps while the signature Ford trapezoid grille with black plastic inserts gives a good contrasting look especially in brighter body colours. The pronounced wheel arches and subtle crease in the sides give the car a mature look. From the rear, the Fusion-like vertical taillights and a mock plastic diffuser adds some zing to the design. Inside, the Figo reflects its exterior design. It uses similar parts from the older Fiesta, such as the steering wheel, stalks, air-con vents and control knobs. The interiors look dated when compared to the Beat. The instrument cluster design and silver-finish centre console to name a few are the only modern touches. Overall, the Figo is the smarter looking of the two cars while the Beat is a fresh and modern design that appeals more to the younger audience and looks like it won't age quickly. In terms of space, the Figo is the more spacious car offering more room for passengers and boasts of a bigger boot. The Beat on the other hand is good only for four adults and offers very little boot space. The all-new diesel engine in the Beat (designated XSDE Smartech) is a three-cylinder version of the Chevrolet SDE four-cylinder diesel which is essentially the award-winning Fiat JTD engine (which the Suzuki DDiS is a copy of) that has gone on to become the benchmark small capacity diesel in India. But this isn't just a case of hacking off one cylinder, the bore at stroke (69.7x82mm) is altered from the Fiat's (74.2x75.6mm) and a tremendous amount of work has gone into curbing the vibrations and the inherent imbalance of a three-cylinder engine while also mapping and fine-tuning the engine for the best fuel efficiency possible. With a deficit of one cylinder, the Beat produces 58.5PS of maximum power at 4000rpm and a decent 150Nm of torque at 1750rpm. These numbers make it the least powerful common-rail diesel engine in the country but respectable for an engine that displaces just 936cc. The Figo uses the Fiesta Classic's 1.4-litre TDCi DuraTorq oil burner that displaces 1399cc and produces 69PS of max power at 4000rpm while the maximum torque is rated at 160Nm and produced at 2000rpm. In fact, on paper the Beat produces more power per cc than the Figo. The Beat features a DOHC cylinder head and four valves per cylinder compared to the Figo's single overhead camshaft and two valves per cylinder layout. In terms of pure performance the Beat actually surprised us with its 0-100kmph time of 19.02 seconds being a wee bit quicker than the Figo's 19.39seconds. The Beat hits the quarter mile in 19.89 seconds while top speed is impressive 152kmph. The Figo takes 21.2 seconds for the quarter mile run while top speed is slightly lower at 151kmph. In our first drive report of the Beat diesel, we noticed that the Beat felt a bit slow while overtaking specially at speeds above 70kmph. However, when it comes to the Beat's roll-on figures, 40-100kmph in fourth and fifth gear is achieved in 17.8 seconds and 24.81 seconds respectively. While the Figo's 40-100kmph times are 20.57 seconds and 31.26 seconds in fourth and fifth gear respectively. The Beat diesel's kerb weight has gone up by just 62 kilograms when compared to the petrol variant and is 88 kilos lighter than the Figo diesel. This translates to a power to weight ratio of 56.96PS/ton, 4.8PS short of the Ford. However as the numbers prove, the Beat (with its shorter gearing) is the quicker car and that's impressive for a car that has a 463 cubic capacity deficit. However, in the real world, the Figo has the nicer engine to drive. It displays very little turbo lag and has a linear power delivery. The Beat's turbo kicks in after 1500rpm and there is noticeable turbo lag, especially in higher gears (that have taller ratios to deliver that fuel efficiency). Besides, the Beat's shorter gear ratios mean more gear shifting in the Chevy when compared to the Ford. The Beat's gearbox is very spongy and not as slick and precise as the Figo. Both in the city and on the highway the Figo is definitely the better car to drive. When it comes to fuel efficiency, the Beat has a rated iCAT figure of 24kmpl while the Figo's ARAI figure is 20kmpl. In our fuel efficiency tests, the Beat returned 16.8kmpl and 23.3kmpl in the city and highway respectively, translating to an overall figure of 18.42kmpl. The Figo returns 15.83kmpl and 21.67kmpl in the city and highway respectively, while the overall figure is 17.29kmpl. This not only makes the Beat more fuel efficient than the Figo but also the most fuel efficient diesel hatchback in the country. In terms of refinement, both cars are well insulated and there is not much cabin noise. The Beat's engine however is slightly more refined and vibration levels are lower. Both the cars feature similar suspension layouts  MacPherson struts up front and twist beam at the rear. The Beat diesel now features a new electronic power steering unit that increases steering weight as the speed increases. The car feels light to throw around traffic and at the same time the steering feels more direct at higher speeds. Ride quality has improved thanks to new gas-charged shock absorbers while the wider 165/65 R14 tyres aid in slightly better handling and braking than the petrol variant. But the Figo is the dynamic benchmark. It definitely handles better than the Beat, by a long margin, and responds very well to enthusiastic motoring exhibiting more cornering grip, less understeer, better body roll and delivering better feedback. High speed stability is also better in the Figo and it feels vastly better over bad roads. It's only at slow speeds in the city that the Beat deliver a better ride quality, sprung as it is a bit softer than the Figo, but in all other conditions the Ford wins this round. When it comes to braking the Beat is the better of the two, 100kmph to standstill in 3.20 seconds covering 44.99 metres while the Figo does the same in 3.44 seconds covering 47.99 metres. Both cars get ABS on top-end variants. Pricing plays a crucial role in this segment and the Beat wins this round priced at ` 5.13 lakh (on-road, Mumbai), Rs 33,000 cheaper that the similarly equipped base-variant of the Figo. Between the ABS and airbag-equipped top end versions the Beat, at Rs 6.48 lakh, is Rs 11,000 cheaper than the Figo while also getting additional equipment like rear power windows, alloy wheels, climate control and front fog lamps. Additionally the Beat offers a 3 year/1,00,000km warranty while the Figo makes do with 2 year/1,00,000km. And crucially the Beat's overall fuel efficiency bests that of the Figo by 1.2kmpl . Thus if value for money is your overriding criteria we have a new segment leader in the Beat diesel! But we also must add that the Figo is the better car overall. It doesn't look as good as the Beat but it has significantly more interior space, its ride and handling balance is among the finest in the segment and though on paper it is slower, in the real world the engine is nicer to use and feels quicker and more tractable while being mated to a nicer gearbox. This test would have been a dead heat but we don't do dead heats at OVERDRIVE and the Figo wins this by the tiniest of whiskers.